A local resident has recalled how he came across a horrific scene near Ballinderry this week after a lorry containing chicken waste and body parts spilled some of its contents onto the Crumlin Road. Poultry firm Moy Park - which uses outside companies to transport the waste - described the incident as ‘unacceptable’ and confirmed they would be taking appropriate corrective measures. Local man Ashley Dunwood told the Ulster Star that he had noticed a bad smell on the Crumlin Road near the junction with the Station Road on Tuesday. Ashley said: “There was two men doing work on the house earlier, there was this absolutely awful stench. They said it was a lorry drove up the road just there now and left that smell. “I couldn’t understand why the smell had lingered, 10 minutes later the smell was just as bad. 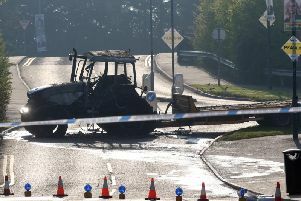 It was revealed that the truck belonged to contractors, hired by poultry processing firm Moy Park. “Whoever it is in these lorries, they are using them to take the waste from the abattoir,” Ashley added. “It’s not covered over in any way, shape or form. “Any bump they hit these guts and stuff spill out all over the road. A spokesperson for Moy Park told the Star that they would be working with the contractors to put in place appropriate measures to prevent this from happening again. They said: “We expect the highest standards throughout our supply chain and this incident is unacceptable to us.